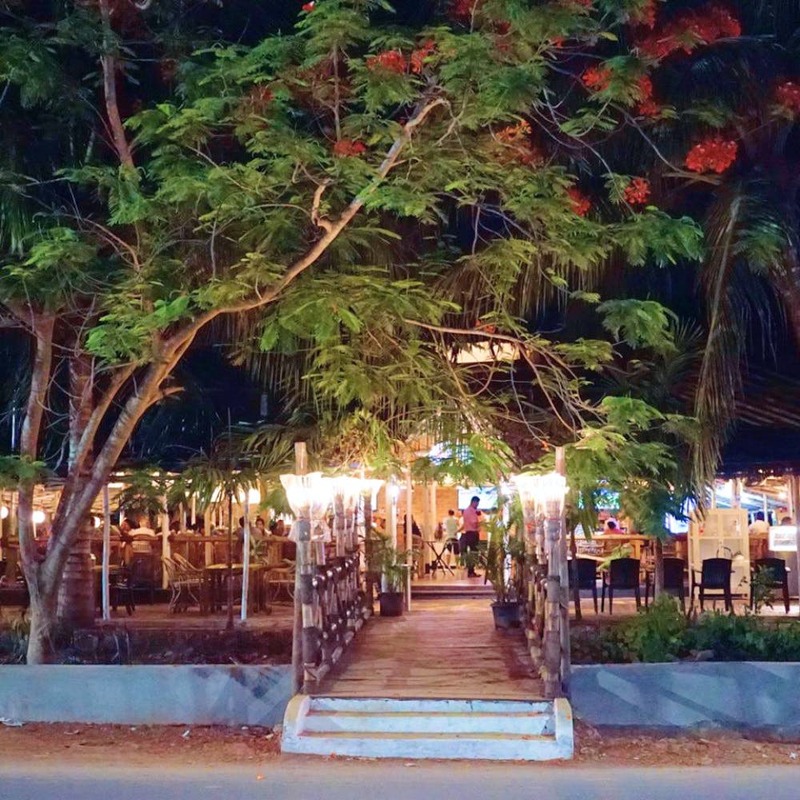 Open through the year, Fat Fish is a charming restaurant on the Calangute-Arpora Road. It serves up stellar fish thalis and other Goan delicacies. Their seafood and fish thalis are epic! The breezy laidback ambience, fish thalis that serve up a selection of really fresh seafood, and Goan dishes done right, this one deserves a visit. Fashioned like an open gazebo, there’s plenty of light and breeze that pours into the massive space, making it an ideal lunch spot with the gang. Fat Fish’s menu is pretty vast and includes Goan, Indian, Italian, Tandoori fare and a spattering of Continental. But when in Goa, go the Goan way. We ordered their Special Goan Fish Thali along with a King Fish Recheado Masala Fry. We were rewarded with a massive thali. And at just INR 200 something, we got a generous mound of steamed rice paired with two kinds of fish curry. A mellow, coconut-based curry while the other came with a hit of chilli. There was also a serving of crab curry and although the crab didn’t have much meat on it, the thick, coconut-based gravy was infused with the sweetness of the crabmeat. Beside it, was a Mussels dish that was lightly tossed in coconut, onions, and a few spices. We also got a serving of vegetables done in typical Goan style. There was also a giant slice of rawa-coated, fried King Fish that added crunch to the thali. We washed all of this down with a glass of chilled beer (that have plenty of brands on tap). Their Goan Sausage Pulao is one of the best we had in the sunny State. The generously spiced rice was accompanied by the tanginess and the smokiness of the cut up sausages and made for a heavenly dish. From fellow Fat Fish fans, we’ve heard great things about their Prawn Butter Garlic that comes drenched in a silken sauce. The desserts here too deserve a mention with the gooey and rich chocolate brownie and the luscious caramel custard being unanimous favourites. The fish thali is only available between 1-3pm and the place gets packed during the peak season, so be prepared to wait... It'll be totally worth it.